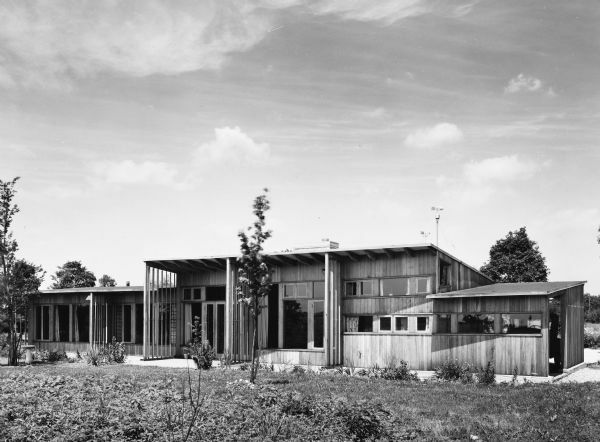 The Hugh and Minna Duncan house was designed by the architectural firm Keck and Keck as Project #268 in 1941. The Duncan house was a Keck "Solar House" and was studied by the Illinois Institute of Technology to measure its energy efficiency. This is a photograph of the back of the DeCoster House in Flossmoor, Illinois. Hugh Duncan was a Sociologist at the University of Chicago. Hedrich Blessing Original negative number 6703 Y George Fred and William Keck were born in Watertown, Wisconsin, and operated an architectural office on Michigan Avenue in Chicago, Illinois.